Jonathan Drouin, Seth Jones, and Nate MacKinnon have dominated the Canadian Hockey League this season. They’ve done it surrounded by analysis, expectations, and media pressure. All three of them have that in common. But only two of them are expected to end up in Sunbelt markets come June 30. And those sunny, southern cities are about to receive a massive shipment of elite talent. The Hockey Writers’ Mike Colligan wrote an extended article in November of 2012 entitled Gambling on Hockey in South Florida. 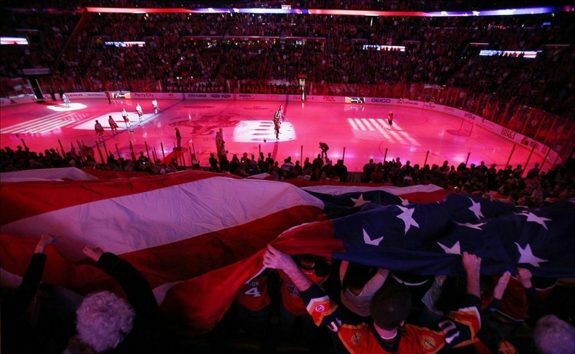 In it, Colligan looked at how the Florida Panthers are actually a successful franchise despite all the negative press they receive. Colligan spoke with Michael Yormark, the President and CEO of Sunrise Sports & Entertainment (the Panthers’ primary ownership group). Yormark had remarks that may have surprised more than a few readers. “From the moment I came to this marketplace nine years ago, I said we weren’t going to compete with these other franchises head-to-head from a sports perspective,” Yormark explained. The Panthers had a disappointing season in 2013, finishing last in the Eastern Conference, a position that ended up with them receiving the second overall pick in the upcoming NHL Entry Draft. As such, they’ve been judged numerous times. In comes the silver lining to their season. Florida now has the opportunity to select a franchise player. It’s expected they’ll end up with either Jones or MacKinnon; both have the ability to be their cornerstone for the next fifteen years. If it’s MacKinnon, the Panthers should be able to increase their goals for, having come last in the East this past season; with goals against, they were last in the league, so Jones’s addition would be just as significant, if not even more. In terms of attendance, it’s important to note that the Panthers’ average game attendance wasn’t all that bad in 2013’s shortened season. During the team’s 24 home games, an average of 16,991 people showed up. That was good enough to place theme twenty-second league-wide. Clearly, all those empty seats on television don’t tell the whole story. But see that grey hair in the bottom left corner of the image above? Insertion of either Jones or MacKinnon into the Panthers’ lineup may just bring in a new generation of fans, one that doesn’t yet have veteran hairs on their respective heads. Call it a ridiculous theory if you must, but Yormark won’t be with you. MacKinnon or Jones may be able to provide the spark that keeps those teenagers around. The support of young fans is what keeps Sunbelt teams in business. Winning is consistently attractive; it doesn’t work the same way a teen fad does. Bring in a young star whom Sunrise-area fans can relate to, and the results could be astonishing. 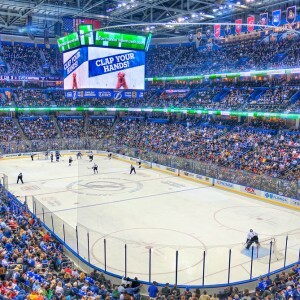 The Tampa Bay Lightning finished in the top ten in league attendance for the 2013 season. Exhale. Get it out of your system now. The Lightning reeled in an average of 19,055 fans and finished eighth in attendance across the NHL. Consider that it placed them ahead of three Canadian teams’ attendance, and it’s more impressive than it sounds. But the question remains: why does no one know? Perhaps it’s because Tampa Bay is in Florida; maybe it’s because they’re just a Sunbelt team; it could be that having Steven Stamkos keeps all the attention on the ice and none in the stands. Maybe all those “Go Leafs Go” chants Canadians hear while watching Lightning games in March set a negative image. No matter the reason, the Lightning have a surprisingly strong attendance that nobody north of Tennessee knows a whole lot about. The third overall pick is about to change that. Aleksander Barkov, Drouin, and Valeri Nichushkin are the names being tossed around in rumors surrounding who Tampa Bay will select. In terms of refuelling an image, Barkov isn’t a flashy enough name to do that. That’s no slight against the Finnish forward. But Drouin and Nichushkin have enough North American recognition to refuel southern passion. Some in Sunbelt markets may feel their team is unfairly judged, and some may even say this post is critical for no reason. To those who feel that way, don’t take it as criticism. Instead, look at this as an opportunity for light to be shone on your team. Canadians take southern hockey teams seriously; the markets, well, not so much. And a couple of top five selections in the 2013 NHL Entry Draft are about to make it happen.